The Internet has connected the entire world into one big cyberspace where people can instantly communicate and exchange data with each other regardless of physical location. Just a few decades ago, people had to use courier services, which typically took a couple of days or weeks and cost a significant amount of money, just to exchange letters and messages. The emergence of emails has made it possible to exchange messages within seconds, and has brought down the cost of exchanging messages to practically zero. Similarly, the rise of digital currencies has achieved the same feat with monetary exchanges and transactions. It has allowed the exchange of money between people without requiring the physical transfer of cash, expanding the possibilities of the internet to online payments and transactions between people even when they’re thousands of miles apart. Many digital currencies, however, come with their own security concerns and may be susceptible to fraud and hacking. With the raise of digital currencies rises the demand on cryptocurrency developers. More recently, cryptocurrencies emerged as a solution to the many security risks involved in most digital currency transactions. Whereas typically, digital currencies required some central authority to regulate transactions and detect fraud, cryptocurrencies work without the need for one. Instead, cryptocurrencies normally use a blockchain, a public record of transactions that are maintained by an entire network of computers, to validate transactions and provide reliability. A blockchain is secure by design, because transaction records cannot be altered once they’ve been recorded in the blockchain without disrupting the entire network. The most popular cryptocurrency by far is the bitcoin, which holds over 61% of the total market capitalization of cryptocurrencies. Users typically use third-party services to store and manage their bitcoin credits, and these services are commonly called bitcoin wallets. One of the most popular providers for such bitcoin management services is Blockchain, aptly named after the technology behind bitcoin. In this article, we take a closer look at bitcoins and Blockchain, and how Blockchain and bitcoin development can help businesses. Created on August 2011, Blockchain is a company that provides three core services. Their first service, available from Blockchain.info, is a blockchain explorer that allows users to explore bitcoin transactions and quickly check the status of any bitcoin transaction. Just over two years into the creation of Blockchain.info, it became the most popular bitcoin website in the world with 118 million monthly page views and 3 million monthly unique visitors. Moreover, it has become a standard reference for bitcoin statistics, and it is being used by popular financial companies like Reuters and Bloomberg for their reports. Another core service provided by Blockchain is their bitcoin wallet. This service enables users a simple and secure platform through which they can manage their bitcoins, as well as send and receive bitcoin payments to and from other users. In addition to bitcoins, the Blockchain also supports ether, which is the currency used for the Ethereum platform, another emerging cryptocurrency that is gaining momentum and is the second most popular cryptocurrency after the bitcoin. Blockchain currently hosts over 18 million cryptocurrency wallets and has processed over 100 million transactions between users from over 140 countries around the world. The third core service provided by Blockchain is their developer platform, where they provide what they claim to be the world’s most used cryptocurrency APIs. With these APIs, developers can easily integrate Blockchain’s services into their applications. Developers can also use these APIs to enable their users to pay with bitcoins or ether from their Blockchain wallets, check transaction statuses, and even check bitcoin and ether exchange rates and statistics within their application without having to leave and open a separate browser. The Blockchain API currently supports Python, Java, C#, Ruby, PHP, and Node as programming languages for Blockchain programming and bitcoin programming. If you’re looking to add support for bitcoin to PHP applications or if you’re looking to create a Blockchain Java app, hiring Blockchain developers can help you use these APIs. When looking for a good Blockchain developer to integrate Blockchain functionalities into your application, here are some skills and qualifications you should look for. A Blockchain developer won’t be very reliable if he doesn’t understand how bitcoins and ethers work. A good developer has to have mastered the basics and fundamentals of cryptocurrencies in able to be efficient at Blockchain programming and properly using Blockchain’s various APIs. This includes some understanding of how a blockchain serves as the backbone that powers bitcoins. Blockchain’s APIs support the six programming languages mentioned above, so if you’re planning to create an application with which to integrate Blockchain’s services, it will be best to use one of these languages. When you hire a Blockchain developer, make sure he’s proficient in the language you select for your project, so he can smoothly integrate Blockchain functionalities with the rest of your application. Understanding the theory behind cryptocurrencies may be useful, but actual experience in transacting with these currencies will give you a great deal of advantage when leveraging your application to deliver the best user experience possible. By having actual experience, a developer can easily understand the needs of your application’s users and easily build the app around these needs. Here are some sample resumes of actual Blockchain developers to give you a better picture of their usual background and skills. It is clear from the above figure that Ukraine developers offer by far the most affordable rates among the countries we compared and allow companies to get huge savings ranging from 45% to up to 70%. So if you’re looking for Java Blockchain developers, hiring from Ukraine will be your most practical option. There are several ways to hire Blockchain developer. Let’s take a look at three of the most popular hiring options and see which one is best for you. You can always take the traditional route and hire a bitcoin developer from your local market. One way to do this is by posting jobs at one of the many job search websites like LinkedIn, Glassdoor, and Indeed. 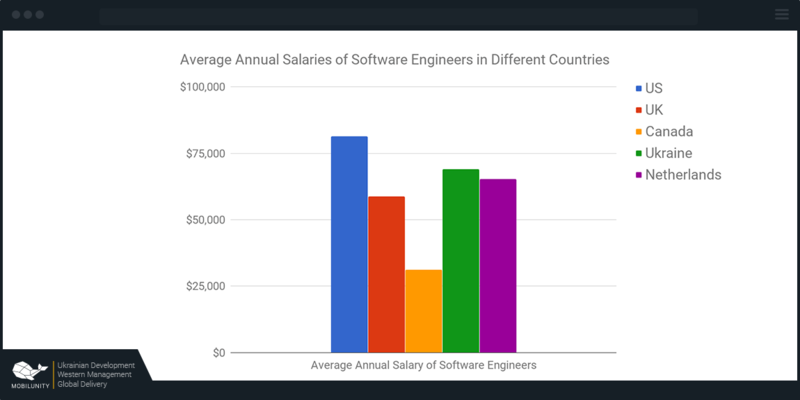 This method is the most direct, but it can also be the most expensive, as the cost of hiring developers in many countries can be very high. In addition, this method will require you to provide physical resources like office workstations and computers for your hired developer, pay for his own software licenses, and pay for government-mandated fees like taxes and insurance. Moreover, this usually involves long-term contracts, so you will have to keep your developer even after your project finishes. You can also hire freelance Blockchain developers. One way to do this is by browsing through freelance portals like Upwork, Freelancer, or Toptal. This method can be quite cheap due to the intense competition in the freelancer community, but it can also be very risky, because your freelancer has little accountability for your project and can simply opt out of your project at any time, without any obligation to notify you properly. The quality of work that you get can also be at stake since the skill levels of freelancers can be highly uncertain. One other option you can take is to hire a dedicated team of Blockchain developers from a third party company that provides dedicated developers. With this method, your developers work for you full-time but stay within their company’s premises to use their office resources. This method therefore also tends to be quite cheap, as you won’t be having to allocate physical and digital resources. Moreover, you also won’t be having to pay taxes and insurance, as the developers provider will shoulder those expenses. What’s more, you are able to take full advantage of the low developer cost in some countries to further shrink your expenses. In addition, you get full reliability and accountability from your developers. To give you even more room for savings, this method also allows you to easily add or remove developers as your requirements change, thereby giving you full control and scalability for your project. Clearly, hiring dedicated Blockchain developers is your best choice, as it achieves the perfect balance of affordability and quality. As the popularity of cryptocurrencies as a means of payment continues to rise, the incentive for businesses to support these currencies becomes more and more pronounced. 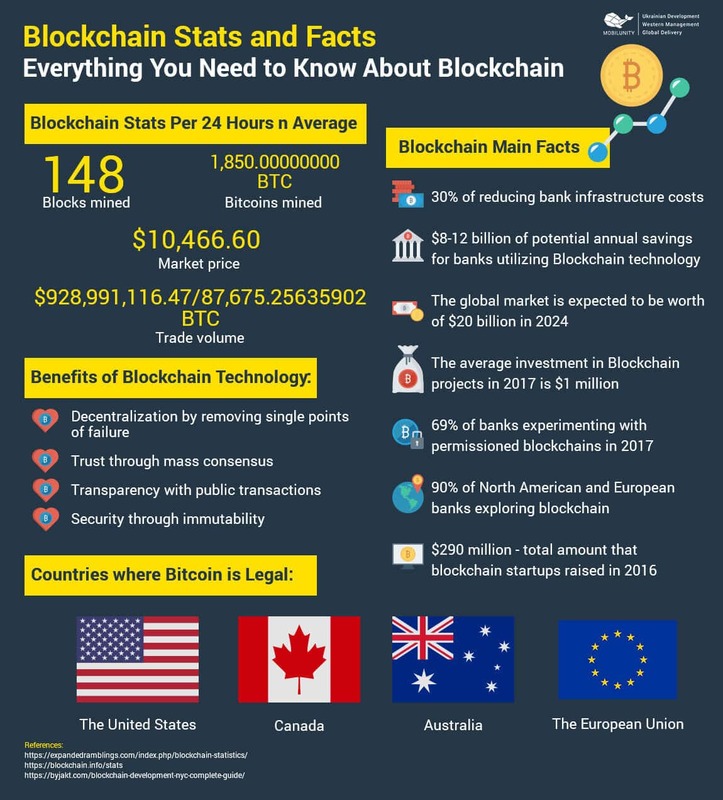 Blockchain is among the most popular platforms to provide support for these currencies, and you can integrate Blockchain’s services into your own applications by hiring a competent Blockchain developer. If you happen to be looking for one, you’ve come to the perfect place! Here at Mobilunity, we have Europe’s best developers skilled in Blockchain technologies and many other tools. Located in Ukraine, we also offer among the lowest rates you can find on the continent. With us, you’re guaranteed to get your money’s full worth. Work with us now and let’s modernize your application with Blockchain technologies!